The Manduka PRO Yoga and Pilates Mat is built to last. This mat comes with a lifetime guarantee, so you don’t have to worry about becoming too attached to it. Bond to your heart’s content. At ¼-inch thick, the Manduka PRO mat will cushion your boney parts. It also comes in two different lengths to give you the option of buying a regularly sized mat or one with a bit more space. The Manduka PRO mat’s closed-cell surface prevents sweat and moisture from becoming trapped within it. When a yoga mat holds onto moisture, bacteria may develop. Because Manduka mats discourage this with their design, these mats are ideal for hot yoga classes. High-density cushioning gives you support on any surface. You can practice on carpet or hardwood floors. You can even roll it out onto a cement surface and complete a practice without feeling the cement’s hardness. This yoga mat becomes better the more that you use it. Manduka makes the PRO mat in a standard size, which is 71 inches long by 26 inches wide, and it weighs 7.5 pounds while the extra-long mat measures 85 inches by 26 inches. The larger one weighs 9.5 pounds. Yoga mats made by Manduka are easy to clean. You can either use a specially formulated mat cleaner or wipe it down with a clean, damp cloth. Don’t submerge your yoga mat in water. This causes the material to break down. It will also void the mat’s lifetime guarantee. 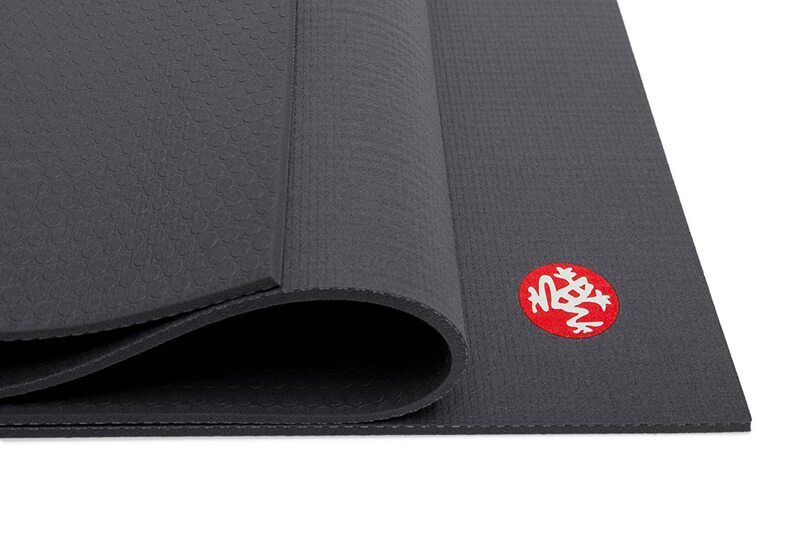 The surface of the Manduka PRO Mat is fabric-like. This makes it easy for you to move from one yoga pose to another. To keep you from sliding during poses that require pressure from your hands and feet, the company added a proprietary dot pattern. This also prevents the mat from shifting positions on the floor during a practice. You will need to ‘break in’ this yoga mat. The mat comes out of production with a film that is somewhat slippery at first. You can remove the film by applying a layer of coarse sea salt to it and scrubbing it with a brush. After rinsing off the salt, let your Manduka mat dry in the sun. When you roll up the mat, be sure to do so with the fabric-like side facing outward. This will keep the corners of your mat flat during your yoga practices. Several color choices are available, so you can get one that matches your style and personality. Options include black, purple, rust and electric blue. When it comes to value and quality, the Manduka PRO mat has both elements in spades with its lifetime guarantee and overall sizing. If your practice is heavy in floor work, then you’ll appreciate that the size of this mat allows you to stay on it throughout your practice. Because the company’s PRO mats are developed for lifetime use, fewer of them wind up in the world’s landfills every year. Manduka’s mats are free of PVC. When companies develop products that have PVC, the production process usually releases toxic emissions into the air. Manduka developed a way to process its products without this unfortunate side effect, so you can buy a Manduka PRO mat guilt-free. The company’s sustainable engineering has resulted in a high quality mat material that will not fade, peel or flake. OEKO-TEX, an environmental certification organization in Europe, has certified the company’s mats as being safe for human contact. The Manduka PRO mat is also 100 percent free of latex. Longevity and sizing options are the main pros of the Manduka PRO mat. You’ll also appreciate its thickness. Not only will you be unable to feel the floor beneath you, but there’s also no need to flip the side of the mat to double it up during poses that require knee or tailbone work. You’ll be able to flow into camel pose effortlessly without modifying the position of your mat. Due to the mat’s quality and durability, it does have some minor drawbacks, because according to some yogis, the mat’s thickness is good and bad. It’s great during your practice, but the mat is less than ideal when it’s time to roll it up and store it. With this mat, you’ll likely need a little extra storage space, nothing too significant though. The Manduka PRO mat is also somewhat heavy. This is the kind of mat that you leave where you practice unless you’re trying to increase your strength by hauling around something heavy. But then again, you do want to get fit, so nothing to complain about. The Manduka PRO Yoga and Pilates Mat provides durability, a perfect degree of cushioning and support. With Manduka’s commitment to the environment, you can feel comfortable buying one of the company’s mats. If you’re in the market for your forever mat, you’ll likely find that yours features the Manduka frog brand in the corner.